Tomorrow was it. 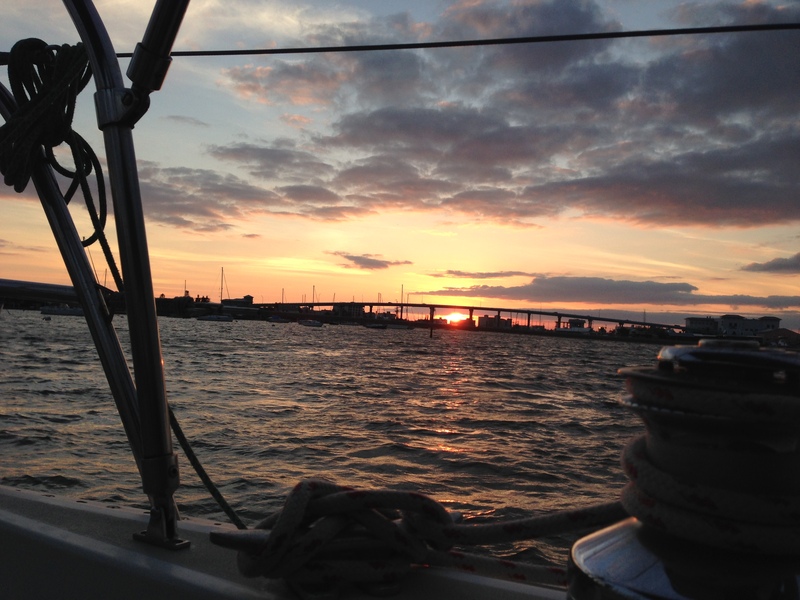 We were going to head out around daybreak to make our final passage south to the Keys. We were beyond excited. 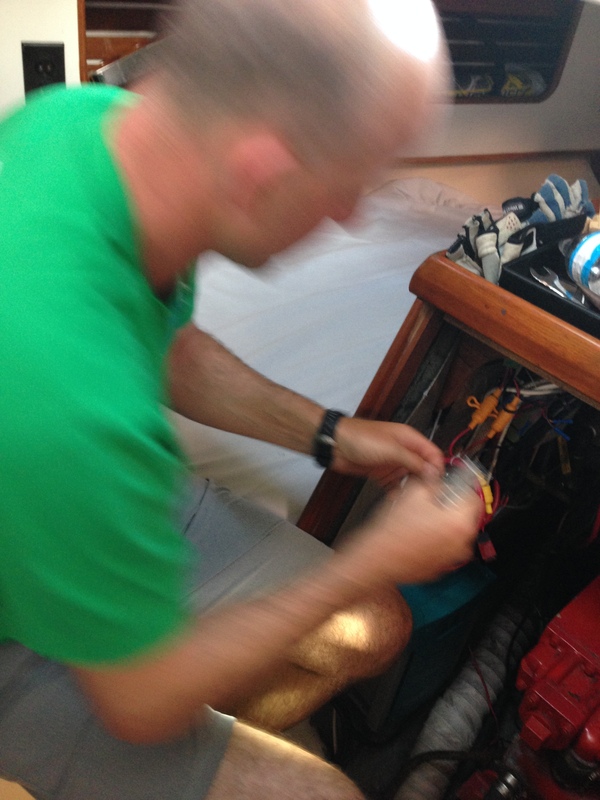 We spent the morning cleaning and readying the boat for the next day’s passage – re-tying the fuel cans we had filled the day before, re-checking the fluids we had topped off, taking out the trash. You know, real exciting boat stuff. We were planning to meet our buddy Johnny and his wife Cindy around mid-morning to make a mega run to the store for provisions. Cindy had driven down to spend the weekend with Johnny and had been nice enough to offer us boating bums a ride to the store before she left. Don’t mind if we do! Knowing we weren’t going to have to haul our supplies back pack-mule style, we made quite the luxurious list and even planned our attack from produce to paper products. We were going to get all Supermarket Sweep on them – matching sweatshirts and all. But, sadly … as ready as WE were to do some serious grocery shopping, it seems the rest of the world wasn’t ready for us. We found Ft. Myers tends to take their Easter pretty seriously. Every place was closed. Every … single … place. We drove by Publix. No. Target. Closed. Winn Dixie? Shut-down. I hate to say it, but we finally ended up at the all-American icon of convenience shopping. Mmmm-hmmmm. Wal-Mart. You can always count on old Wally World to be open. We each made our rounds and packed Cindy’s little car to the brim. And, of course – what do you always want to do after grocery shopping? EAT! After planning for and picking up everything we would need to cook and eat for the passage and the following week, all we could think about was food. 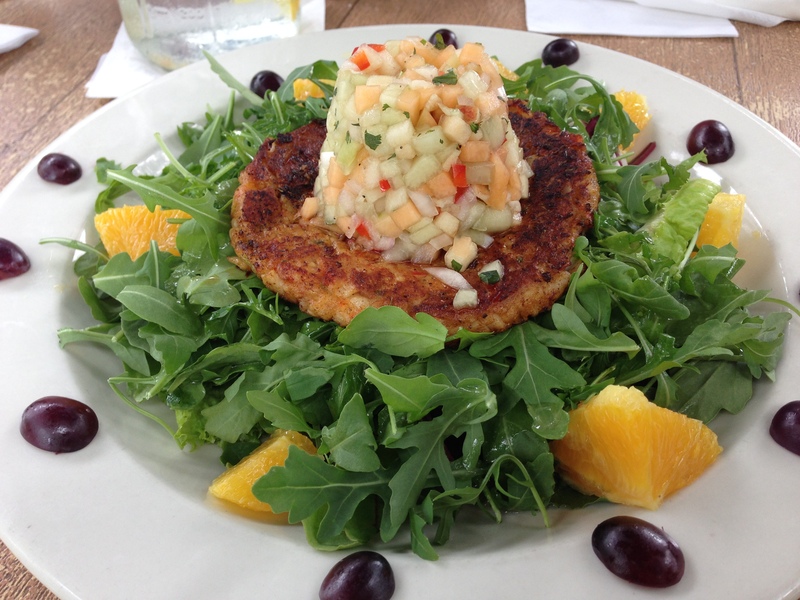 We stopped at this little McGregor Cafe in Ft. Myers and scored pretty good. 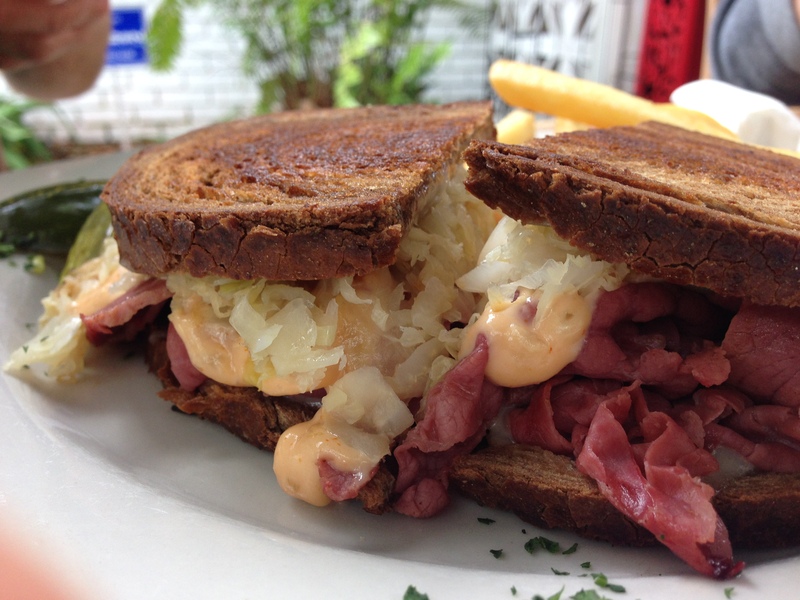 A juicy Rueben sandwich and a lobster cake salad. Yum! But, the best part was our waitress. Bonnie … the Bunny. You see? As much as I love to write fiction – I really don’t have to make this stuff up. 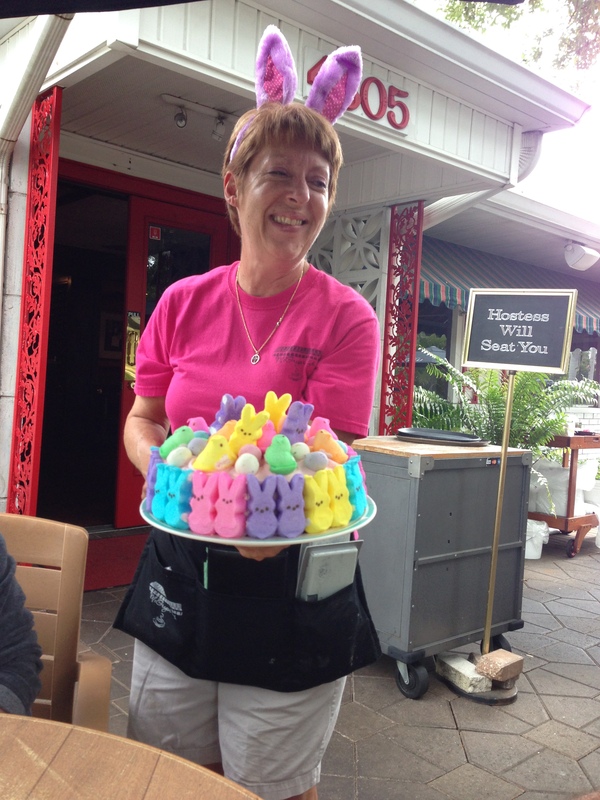 Bonnie (“the Bunny”) pranced around the entire time sporting fuzzy purple bunny ears and offering up what she called her “Special Bunny Peeps Cake” to any poor customer who couldn’t turn her away. She even suffered it on the entire wait staff like office birthday cake. 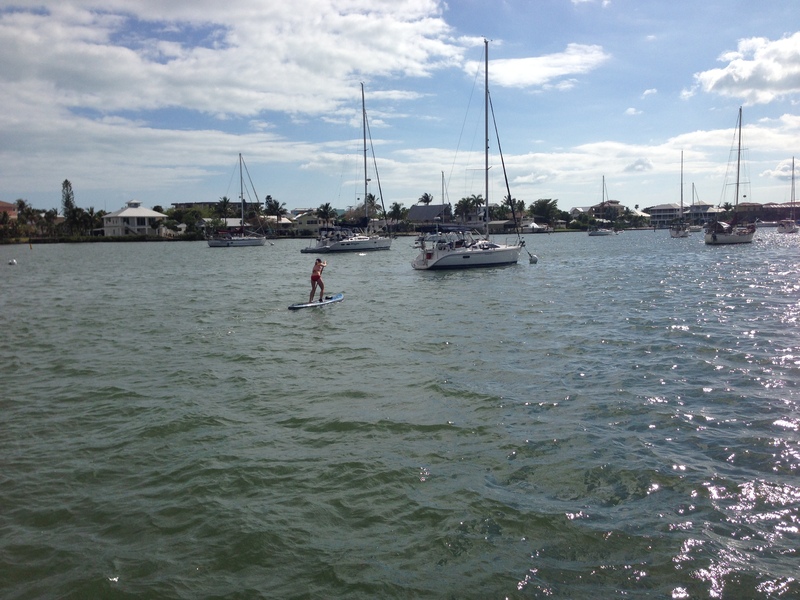 After our big venture to all of the closed stores, we headed back to the boat and packed her up for the next day’s passage to the Keys. 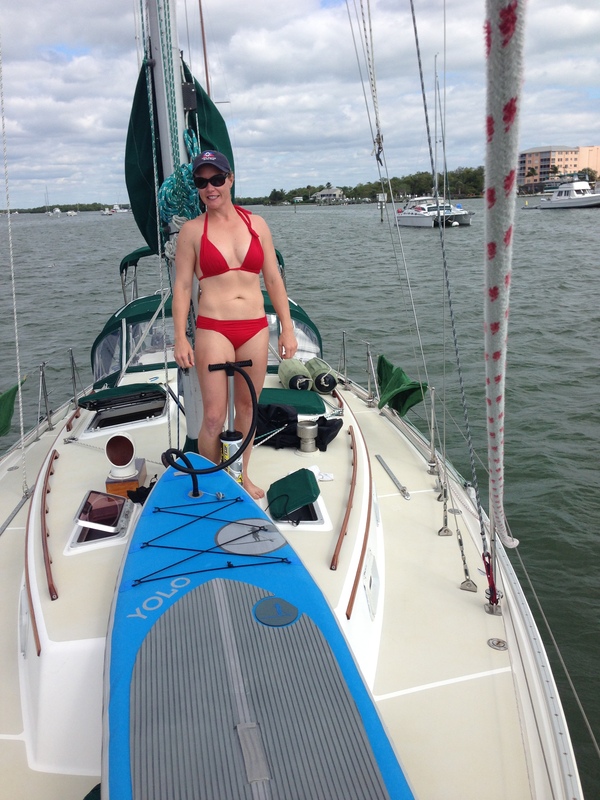 We still had some beautiful afternoon hours left, so I decided to bust out the old inflatable SUP and get to it. Whew! I tell you. 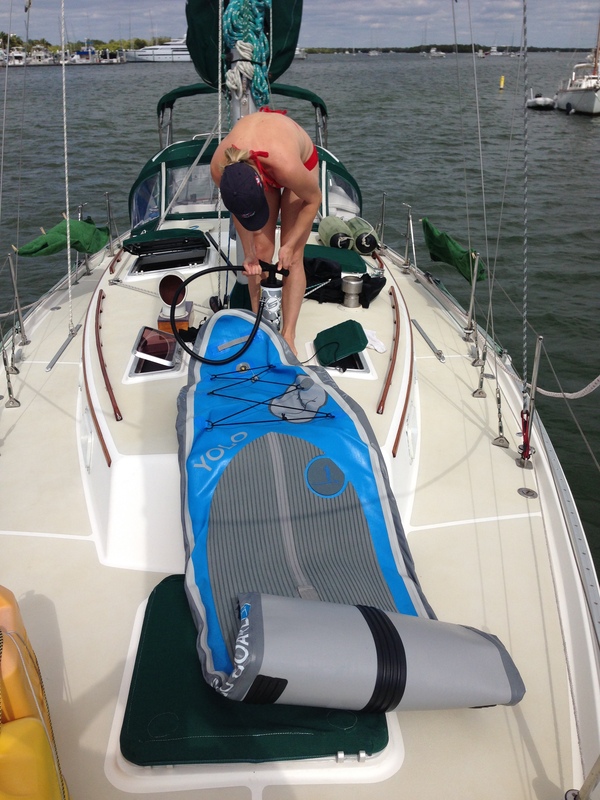 I love that my SUP is inflatable (so we can break it down and stow it down below) but she is a chore-and-a-half to blow up. By the time you’re done, the thought of paddling is exhausting. But, somehow I managed! I tossed her in the water and set to it. Ft. Myers had lots of residential inlets where the houses are all waterfront along the seawall and you can paddle around in each of them, checking out peoples’ boats, backyards, pools, houses, etc. 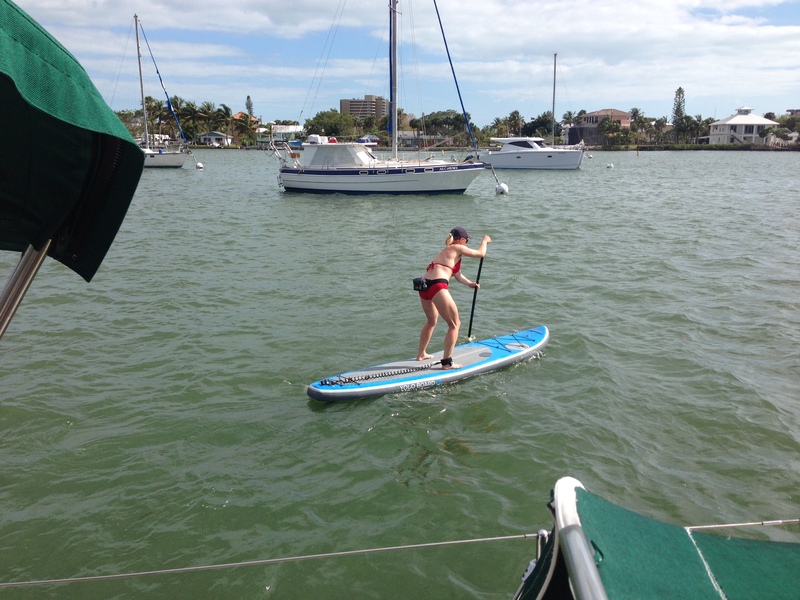 I love paddling around nice waterfront homes. I like to imagine all the costly upkeep and maintenance they must require and bask in the contentment of living on a boat! 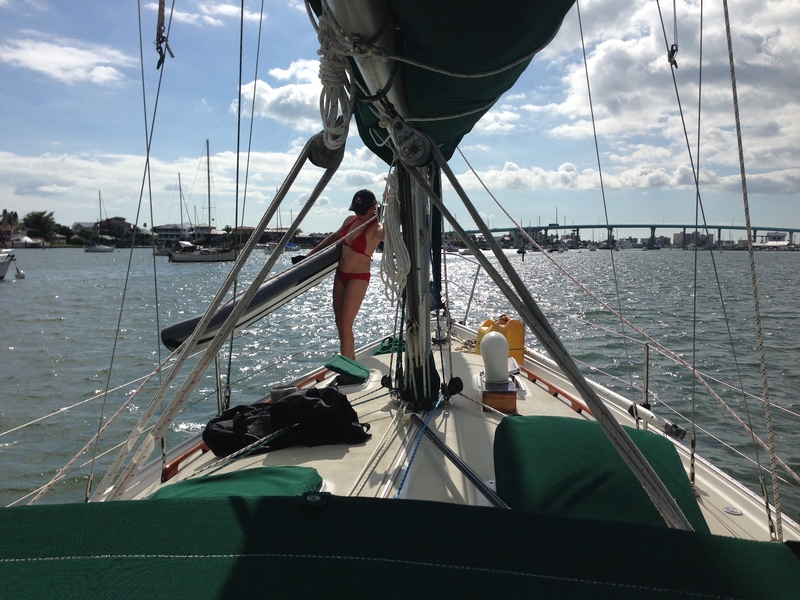 And, I was feeling pretty content … that is, until I returned to the boat and Phillip told me the engine wouldn’t crank. Say what? We’re leaving for the Keys tomorrow. Could you repeat that? But, sadly, it was true. The engine wouldn’t fire – at least not on its own battery. 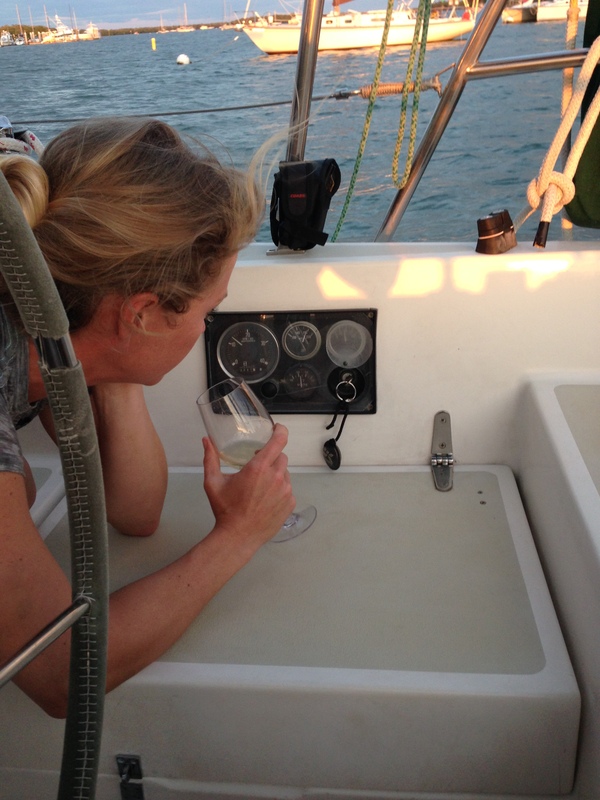 Luckily, we have two different battery systems on our boat. 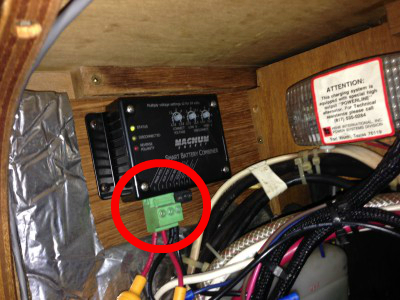 One battery system is dedicated to starting the engine while the second bank (the house batteries) is much larger and equipped to run all the other systems on the boat. We also have a nifty device that allows us to combine the battery systems together if necessary by the simple flip of a switch. When we combined the circuit and pulled from the house batteries, the engine would crank, but she would not fire from the starting battery alone. Errgghh … What did I say about those big waterfront mansions being more trouble than they’re worth? Well, forget that. 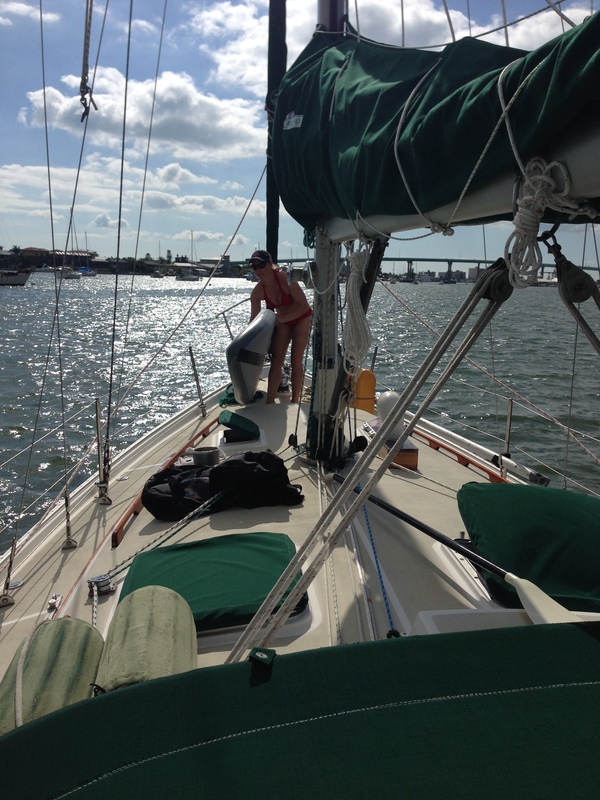 We had boat problems! We traced the connections and wires from the alternator to the battery combiner (which regulates which set of batteries get charged) and found the inline fuses for the starting battery had blown. This meant the starting battery was not getting a charge when the engine was running. This was good news because it was an easy fix. Replace the small fuses and we figured we would be in business. 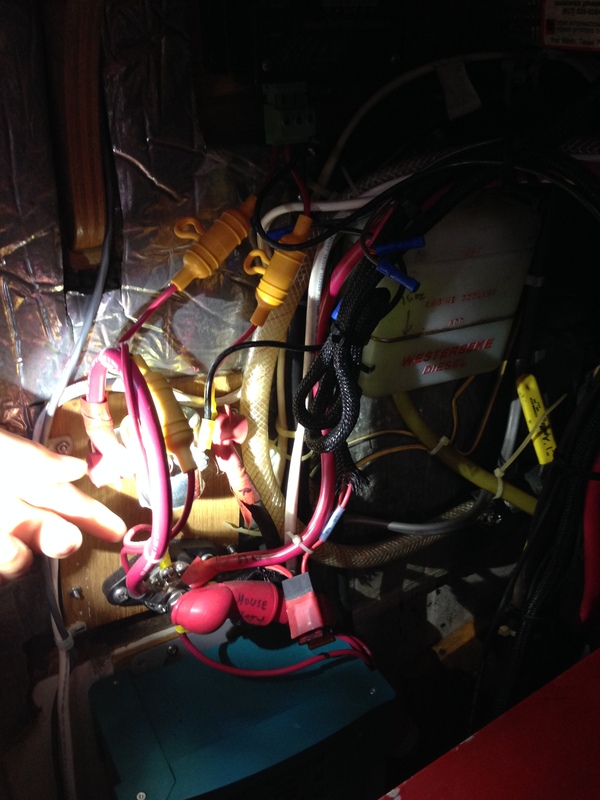 Then, all we needed to do was run the engine for a bit to be certain the starting battery was in fact charging. 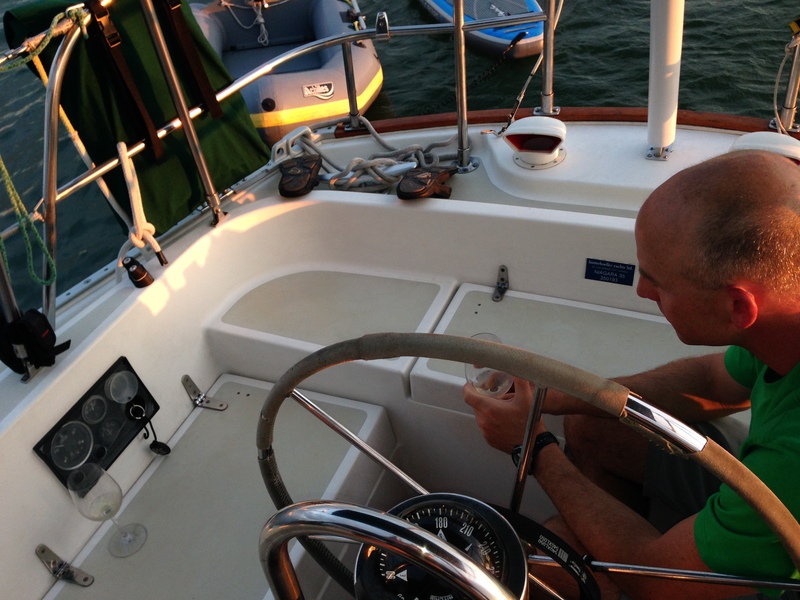 We replaced the fuses, combined the batteries and cranked her up. Everything was running great. 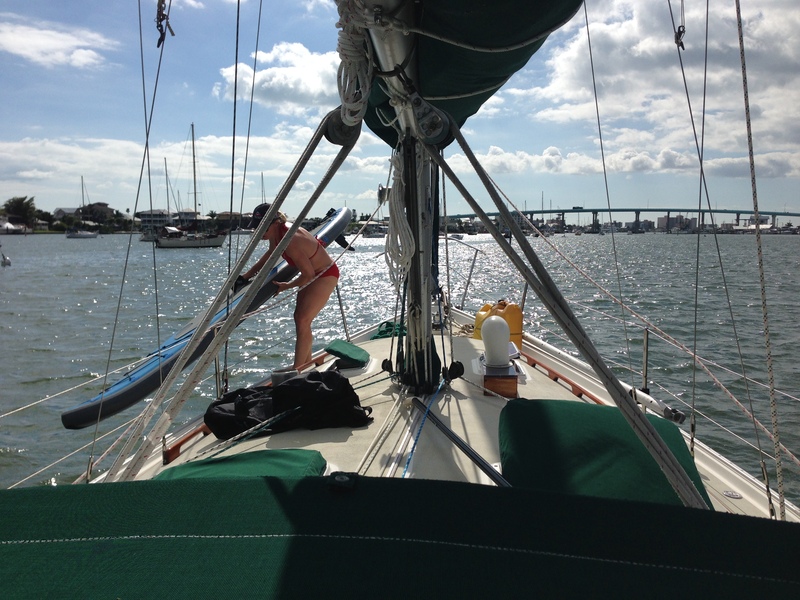 We had water coming out of the back and plenty of gas to give the boat a charge, so we let her purr. 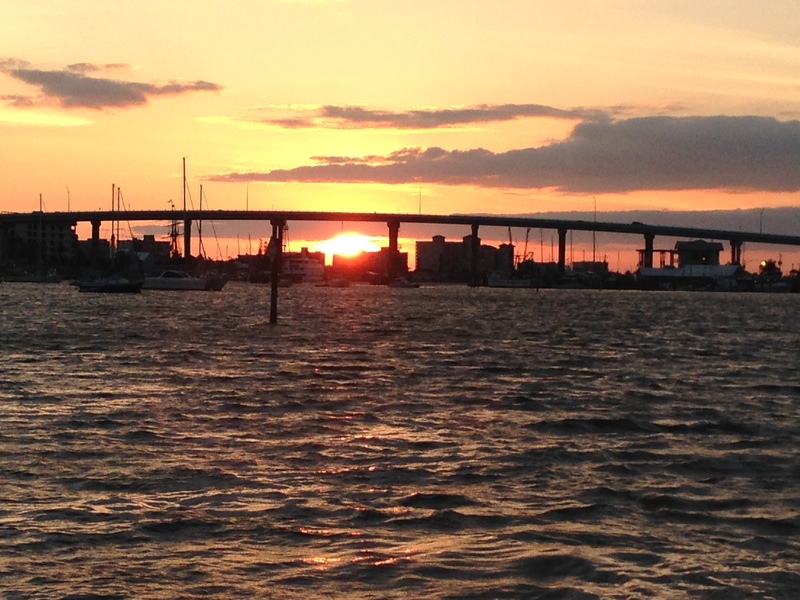 It was just about dusk, so we poured a couple of glasses of wine and headed topside to watch the sun set. Ahhh … Isn’t she beautiful? 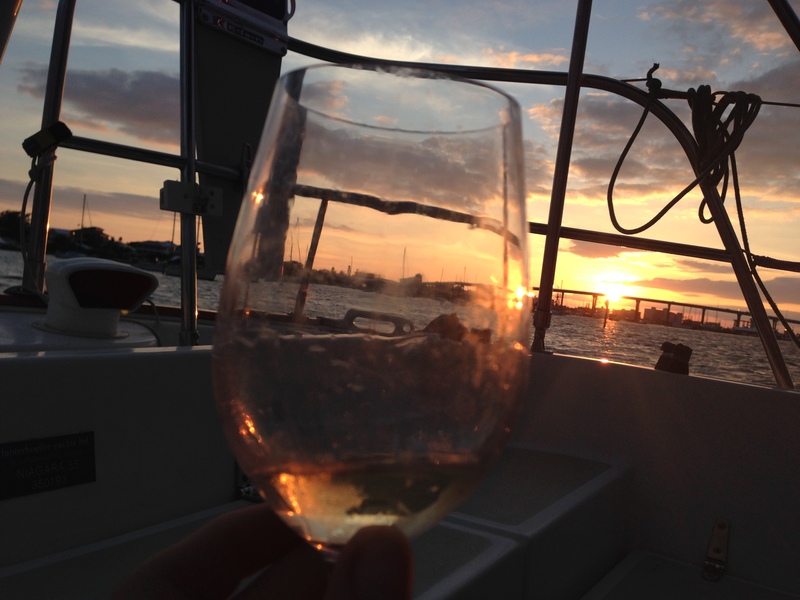 We sipped from our glasses and drank in the pink horizon. Life was tranquil and serene. Everything was perfect … until the alarm went off. Yes, the ALARM. A high-pitched, shrill tea-kettle whistle rang out from the cockpit. Phillip and I jumped up, knocking over our deck chairs and glasses as we scrambled back to the helm as she shrieked angrily at us. It was the high-temp alarm. Picture a car steaming on the side of the road. It meant our engine had overheated. What next? Phillip won’t admit it, but he secretly digs that tune! It’s amazing what you’ll learn. 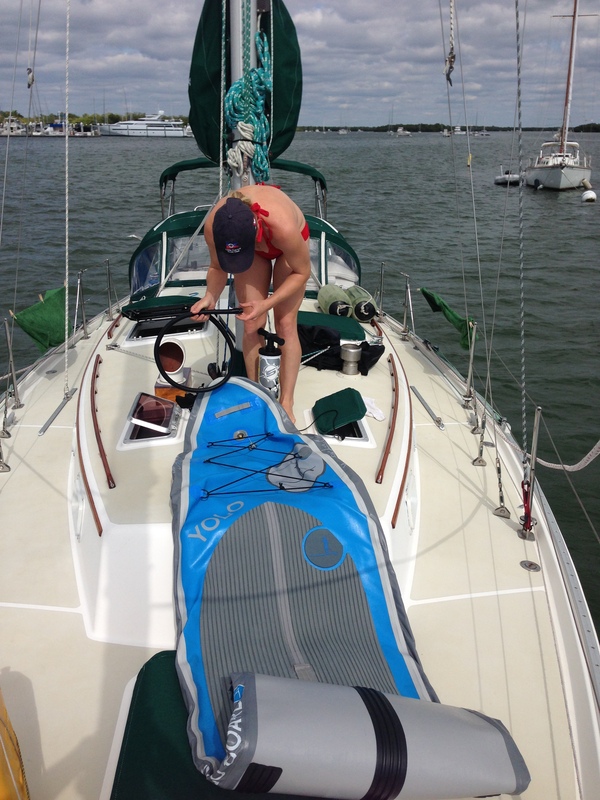 Most of the systems on the boat are really simple if you just take the time to figure them out, and the confidence you’ll gain in handling everything on the boat yourself is easily worth it. So – take some advice from Julia Andrews and get to know her! 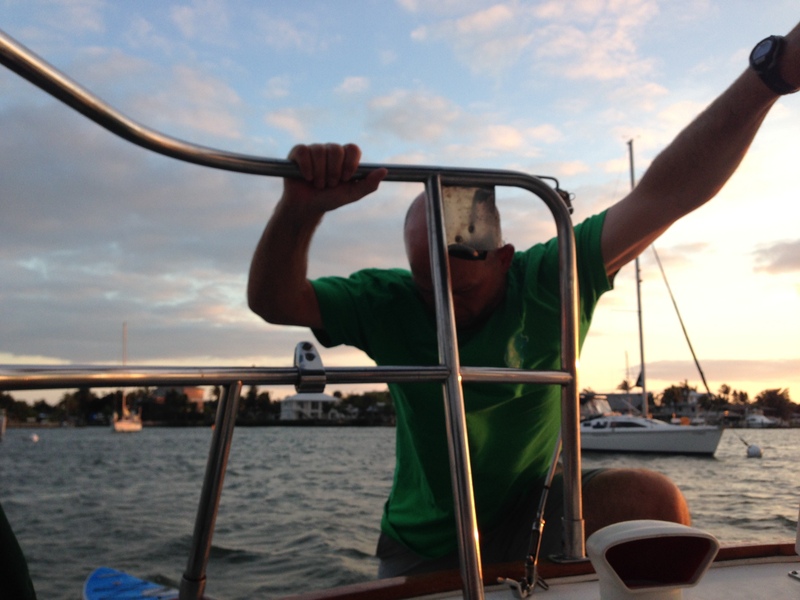 And, while I say that, as much “knowing” as were doing on our boat that evening, we were still totally stumped by the engine overheating. Phillip jumped in and checked the seacock through-hole on the hull of the boat to make sure there wasn’t some trash bag or something caught up in it. Nothing. We let her cool completely down, checked the coolant levels and the seacock (again) and decided to re-crank and see what happened. We both sat in the cockpit watching the heat gage like a hawk. Thankfully, though, she held at her standard operating temp of 180 degrees. To this day, we really can’t tell you what happened. The most likely explanation is that something got temporarily sucked up against the through-hole under the boat and the engine could not pull water in to cool itself. Then when we shut off the engine, the suction stopped and whatever it was floated away. We suppose … That’s all we could do. Was suppose. But, it was getting late and, either because of, or despite, all our efforts, the boat was currently running great and was ready to get under way the next morning. So, we supposed ourselves right to bed to get some rest for the passage tomorrow. 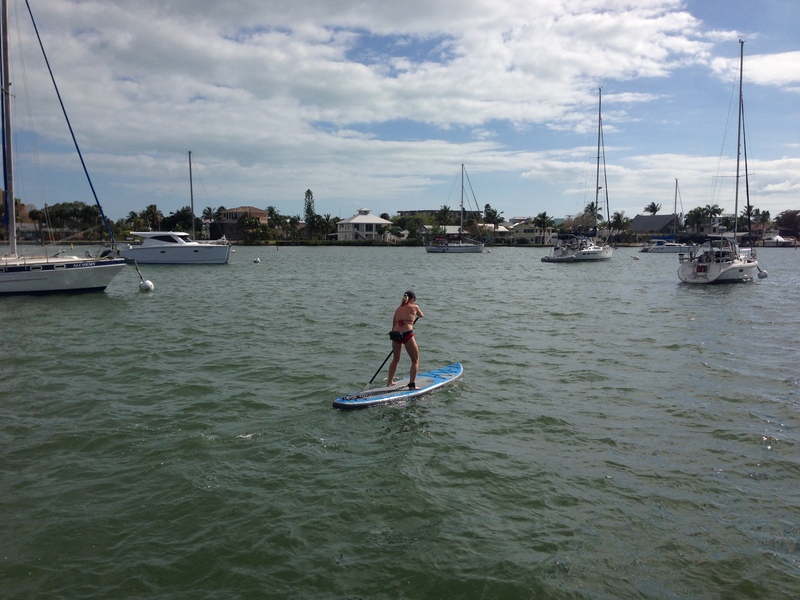 We were just a 24-hour run away from the Keys! 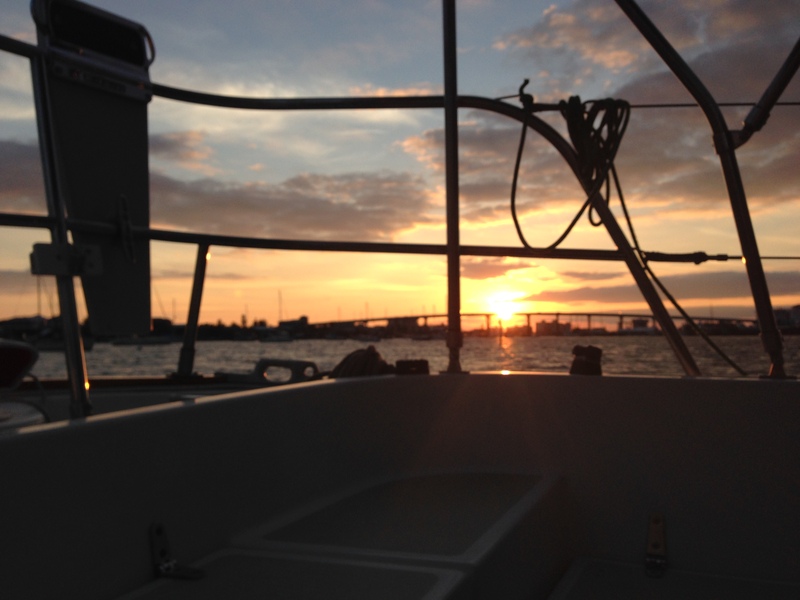 This entry was posted in Boat Projects, Cruise to the Keys 2014, Engine Issues, Equipment Failures, Good Grub, Landlubber Outings, Provisioning, Stand-Up Paddle Boarding and tagged charging the batteries on a boat, cruising to the florida keys, engine high-temp alarm, ft. myers beach mooring field, house and starting battery combiner, inflatable sup, mcgregor cafe ft. myers, office birthday cake, provisioning for passage, supermarket sweep. Bookmark the permalink.